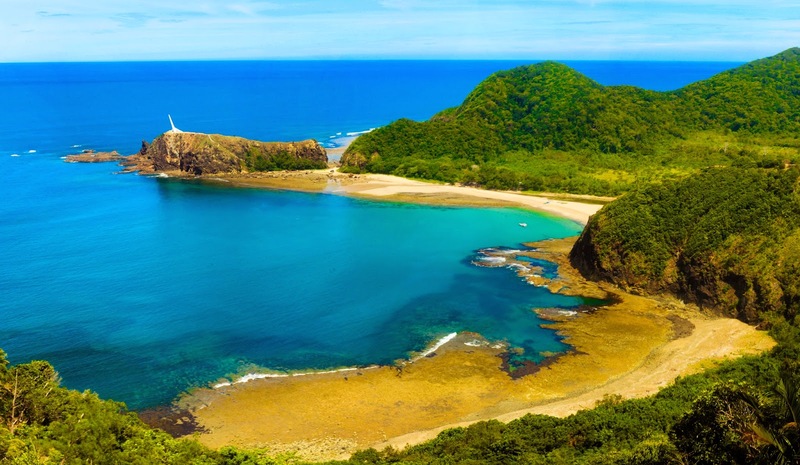 THE Philippines is blessed to have over 7,100 islands – depends if it’s high tide or low tide (smile) – which also means an unprecedented number of beaches as well. There are beaches great for just bumming and sunning, some for swimming and snorkeling, and quite a few for surfing and skimboarding. Continued from last week (See “Travel Bites: Summer fun in the country’s best beaches,” March 25, 2013), here are the rest of our choice beaches from all corners of the country. It is a must-see if you want totally deserted beaches. On a good day, which is the usual on this beach, you won’t bump into any other soul except the locals. There is nothing here except the beach and the calm waters so perfect for swimming, oh! and the towering coconut trees. Accommodations are in the town proper – a good five-10 minutes away by local motorbikes, although I hear beachfront properties are selling briskly these days as investors await the completion of the San Vicente airport and scheduled flights by carriers. There are other beaches and coves in San Vicente, some with even finer powdery sand similar to Boracay’s – here’s crossing our fingers the local government there will regulate the building of resorts in those beaches to protect the environment from overcommercialization. Getting there: Take any commercial flight to Puerto Princesa, and ride a public bus or shuttle van from the bus terminal in San Jose to San Vicente. A habal-habal or a motorcycle used for passenger commute, can bring you to Long Beach. Just go down the main drop-off point and walk to the beach along a marked trail. Needless to say, bring your own provisions for food and water. Nestled at the foot of the Sierra Madre mountain range, Dicasalarin is also favored with rocky formations, and a river that carries fresh water out to sea. So if you’re not feeling the salty waters of the Pacific Ocean, you can also take a dip in the cool river delta instead. The views here are stunning, with the lush foothills at your back, the Pacific blue in front, and the white sand squishing under your feet. Have a picnic at the shaded tables on the beach, down some cold beers, and enjoy the sun and surf. From October to February, waves at the cove reach heights that would delight even professional surfers. Getting there: Unless you are bringing an SUV, most Baler locals don’t recommend a road trip as there is still a portion of unpaved road along the highway. Take a private coach instead via Genesis Transport’s 28-seat Joy Bus which has a restroom on board, snacks and water, an Wi-Fi connection. It also has the regular type airconditioned buses going to Baler (T#709-0803/421-1425). From Baler, hire a tricycle to take you to the river outlet adjacent to Sabang Beach (the main surfers’ area), then charter a pump boat to Dicasalarin (about 45 minutes). You can also rent a private van or car going there (30-minute ride). A tricycle can likewise take you directly to the foot of the hill where an abandoned Pag-asa weather station is located, and you can hike to the beach from there. It will be a tiring uphill climb even for most experienced hikers, before you get to the main trail going down towards the beach. But the sight is breathtaking which makes all the effort worthwhile. This is another island which has been catching the fancy of a number of foreign and local scuba divers because its deep waters are teeming with thresher sharks.But the island also has an immaculate white beach with crystal clear waters which allow you to see through to the bottom. This is another gem that has seen commercialization grow although at a slightly slower pace than other more well-known vacation islands. There are still spots of seclusion away from the maddening din of the disco or karaoke bar in the resort row. Accommodations here attract the beach bums and divers alike and offer beachfront cottages that give you a full view of the sun gently peeking through the clouds as it rises from the horizon (or a grand orange-filled sunset sky, depending on your resort’s location). Getting there: Most major airlines have daily multiple flights to Cebu City from several major points in the country (e.g. Manila, Clark in Pampanga, Puerto Princesa, Iloilo, Davao, etc.). From the airport, take a cab to the Northern Bus Terminal (near SM) and book passage on a Ceres bus going to Maya port. From the port, you can hire a private or a public boat (which you share with other passengers) to Malapascua. After a few days in Malapascua, you may also want to drop by Kota Beach, in Sta. Fe, Bantayan Island which is about 2.5 hours away by motorized banca. The white sand beach is a mixture of fine white and crushed coral. There are hardly any people to bump into at the beach unless it’s Holy Week which attracts even the Cebuanos from the mainland. The waters are calm and limpid, turning to turquoise farther away from shore. Accommodations here are varied, fitting every budget. The sunrises here are uplifting and herald the beginning of great lazy days at the beach. 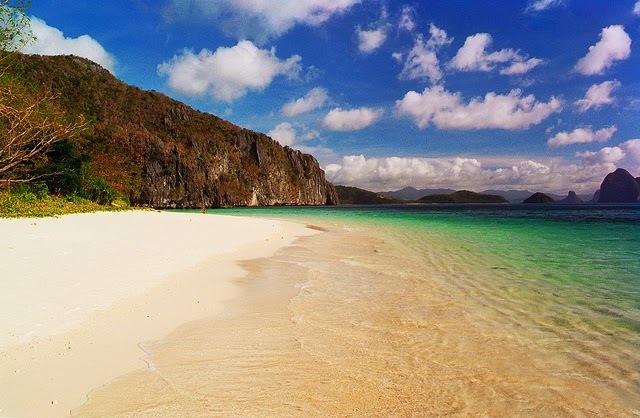 Trust the Europeans to find the remotest and most serene beaches in the Philippines. They’ve staked their claim on Sugar Beach running resorts with basic amenities in the area, with their Filipina wives. The beach sand is a coarse tan in appearance, much like raw sugar, which is probably why it’s named so. Sugar Beach receives but a handful of visitors which keeps it peaceful and tranquil. It’s quite a distance to travel to thus it attracts mostly Negrenses, European backpackers, and other hard-core beachgoers. Most of the time, it will only be you and the coconut trees just soaking up the sun. Even during the peak of summer, the sea is just wide open with only a smattering of swimmers.The waters are pristine and teeming with fish such that it’s quite normal to see fisherfolk in the area hauling in their nets filled with the day’s catch. Dahican Beach has become a mecca for skimboarding and surfing in the Davao Region, as its stunning coastline receives swells up to 10 feet high from the Pacific Ocean. It’s also a popular destination for swimmers because its cool powdery white sand stretches for seven kilometers along the crescent-shaped coastline dotted by lofty coconut trees, and into its clean and invigorating waters. A portion of Mayo Bay whose directly waters feed the beach has been declared a marine sanctuary to protect the dolphins, sea cows, and sea turtles that reside or swim through the area. It’s common to see these sea creatures frolicking in the distance. 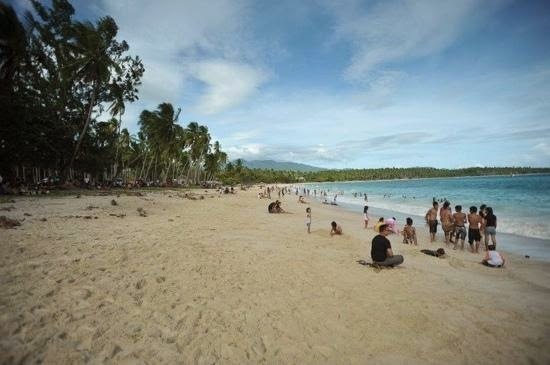 There are very few resorts along the Dahican coastline – most are located a kilometer or two away from the main beach. But there are simple cottages available for rent from the locals to store your beach gear or for picnics. It’s best to bring your own food and bottled water. Getting there: Major airlines have daily flights to Davao City from Manila, Cebu, and Cagayan de Oro. Airconditioned and non-airconditioned buses regularly ply the route from Davao City to Mati – the trip will take almost five hours (or three to four hours by private vehicle.) From the city proper of Mati, Dahican Beach is only a tricycle ride away.